The last time I rode the Apache Trail to Tortilla Flats (actually, the OTHER way, from the Roosevelt Dam thru Tortilla Flats via the dirt part) was this spring, 14 Mar '18, and in general the pavement was DEPLORABLE except for re-paving from Tortilla Flats to the W for a few miles, then like a motocross track in "pavement", ruts, pot-holes, etc for the remaining miles (17?). The re-paving ENDED right around that corner, (Canyon Lake to the right)...! this pic from about a mile N of home. I continued into the city of Apache Junction, then took this a few miles S of the Apache Trail, AZ 88. The Trail is NOW beautifully paved to the end-of-pavement, about five miles PAST (E) of Tortilla Flats, where I took these pics. NOW, however, the highways people have added SPEED WARNINGS right on the pavement just before TIGHT turns...! then about a mile S of that first pic of the Superstition Mountains, I saw where the recent rains had overflowed a kids' platground, this about three miles SE of my place. All-in-all - a GREAT way to ride 140 or so miles in the mountains of S AZ over four hours! onewizard, Fastoman, weljo2001 and 5 others like this. Last edited by fasteddiecopeman; 10-21-2018 at 03:38 PM. Did you happen to see Elizabeth Warren out there? weljo2001 and hawkerjet like this. Rather than start a new thread, I figured I'd add onto this one. then from a bit further E.
A few miles in there's a 'viewpoint' for Canyon Lake, a few miles before Tortilla Flat. My plan for lunch was to ride to the end of the pavement, park there, but I was following a 'slow-poke' (30mph in a 45mph zone... ...), and I could see a bunch of vehicles ahead where I usually stop, so I pulled in for my snack, and to get some pics of the flowers which are 'springing up' due to the amount of rain we've had. then, as I passed the "Ghost Town"
then pavement W, S, then W and S on MORE pavement back home. The ride was 118 miles over five hours and 15 minutes, and gave me just under 60 mpgUS, the result of following slow-drivers. GREAT way to spend that time! biglefti and Buffalo_Bob like this. Awesome ride and images. Thanks for sharing and I like the hanging man....reminds me of the old western cowboy movies we use to see in TV those days..sad no Apachie's..
Great pics as usual Eddie. Hey even California Poppy's in good o'l Zona. Tim - I appreciate you tellin' me WHAT they are.... ALL I know is that they're...ORANGE...! Nice ride Eddie........thanks. Sure is looking green now. 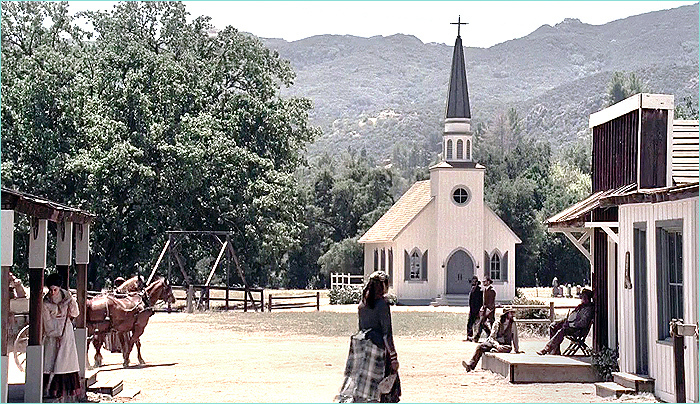 the pic of the church reminded me of Westworld. In the spring time we get entire hill sides covered with them. Breathtakingly beautiful. How nice to live vicariously through others. Great ride, Eddie. Now back to work I go. You guys are only 78 miles from each other. I would join you if I was closer. The PROBLEM is that the '78 miles' becomes 156 miles ROUND-TRIP. When I've done rides up in his area I've ended up riding home after DARK, and I need to use MULTI-LANE roads for at least PART of it, during rush-hour.... THAT is SUPER SCARY! I don't blame you Eddie. I don't ride at night. Their is plenty of danger to be found during the day light hours. Just yesterday I went for a short ride in the hills. Came around a corner and there was a big plastic trash can sitting right in the middle of the opposite lane. Just then an opposite direction car appeared, bearing down on the trash can. I got firmly on the brakes because it he hit the can there was a good chance it would have flown directly into my path. Imagine this scenario at night. Neither one of us would have seen the can til it was too late. Look forward to WHEN and IF we can get together. Chuck (in Tucson) MIGHT be "up" for it, w/ a few of his buddies. BTW - WHAT is this the man, the myth, and the legend stuff...? I rode out there a couple of months ago on my Goldwing. The new pavement sure is nice, but I agree the pace was slow.